I think I have said this in a post before but we are not an animal family. My kids of course love animals but they are the last thing of my list of things to buy. So when we find toys that can be somewhat of a substitute for that it is always a fun day! Our most recent animal toy purchase was Hamsters in a House from Zuru. *We received the products listed below in exchange for our honest opinion. There are not just Hamsters in the house but also playsets! We got three of the sets available from Hamsters in a House and they are not the only ones available. The ones we received were the Ham’s Burger Diner, Little Cupcake Bakery, and the Food Scooter plus an extra Hamster. Below I will show you what is included in each set and what it looks like after it is put together. This is Ham’s Burger Diner. Of the three sets we got this one came with the most amount of pieces to assemble. Also not pictured in the included picture were the stickers. It came with at least 4 stickers that needed to be placed on the set. 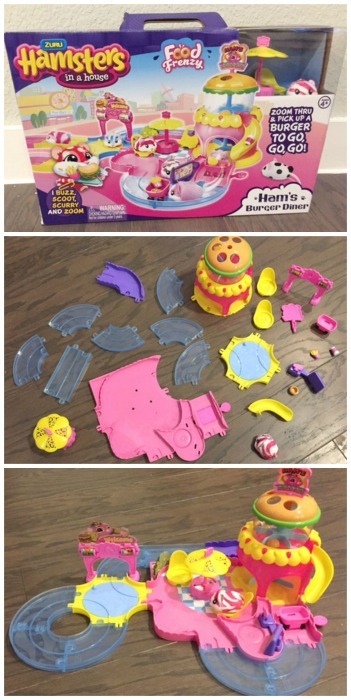 It was very easy to put together, which is always a good thing, and is easy to take apart for easy storage. With this set the hamsters can move around, order their meal, and pick it up at the register. The slide is where the food drops down into the pick up bucket which can then be pushed away by a hamster. This is the Cupcake Bakery. As you can see above it comes with a lot less pieces than the previous set so the set up is a lot quicker. Because it is smaller than the burger diner it is also cheaper (by about $7). There are no special slides but it does come with three small and cute plastic cupcakes that a child can pretend to order with their hamster. This is the Food Scooter. 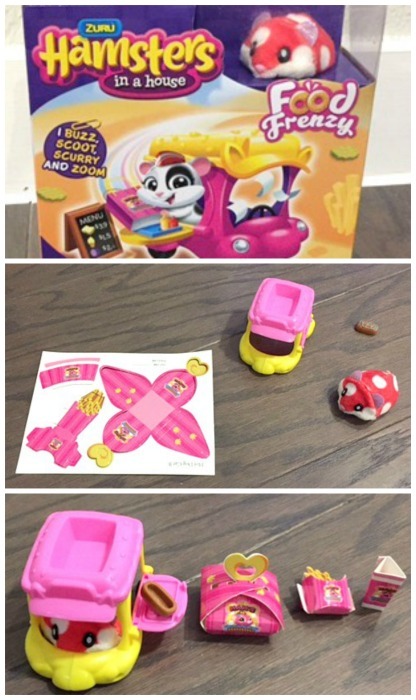 This set comes with a scooter (that has an attached tray), a plastic loaf of bread and three paper food items. I was not very impressed with the paper food items, they were a little hard to put together (I wasn’t able to fully put together the fried) and they ended up in the trash. But the scooter is really cute, especially when a hamster is moving inside of it. All you have to do is put the scooter over the hamster while it is on and the hamster will push the scooter around like it is driving it. So adorable! Above is a quick little video of the Hamsters and what they look like when they move. It is also very fun how the Hamsters move through vibration! They really do look very similar to real Hamsters moving around the house. This brand is just packed full of cute Hamsters and sets to start collecting! I can’t wait for my daughter to start her collection this Christmas! Which of the above sets would your child like to get this Christmas? Or were you able to find one you liked better on their site? Let us know in the comments below! Oh…these are cute! I have a feeling they’ll be under a lot of Christmas trees this year. If they are than there will be a lot of happy kids on Christmas morning!